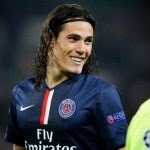 PSG are ready to listen to offers from Arsenal,Liverpool and Manchester United for unhappy striker Edinson Cavani. The Daily Express reported that Cavani and coach Laurent Blanc have fallen out in dramatic fashion this week. While the pair publicly reconciled at the start of the season, it seems things have once again taken a turn for the worse in recent days. Blanc has spoken about his need to be a bit more ruthless in his decision making to help PSG achieve their lofty goals. And reports in France suggest that may mean Cavani is told to pack his bags. Liverpool and Manchester United have both been linked with moves for Cavani in the past but it seems that Arsenal are now in pole position to land the former Napoli star.